Michael was the consummate host. He loved to entertain, to cook giant meals, to show off the house and the view, to keep the music going. Christmastime was an endless string of family and friends; us kids on couches and mattresses on the floors of every spare room; hors d’oeuvres and drinks for everyone who stopped by or came to stay; Grandpa’s recipe for artillery punch chilling in the snow on the deck. Thanksgivings were epic, with tables lined up from one end of the house to another, place settings crammed as close as possible, and extra chairs borrowed from the theater company or the AIDS support group. When we invited ourselves up, when we wanted a place to stay while we showed friends the Cape, Michael never said ‘no.’ Everyone was welcome at Michael and David’s house, within walking distance of downtown and the beach. 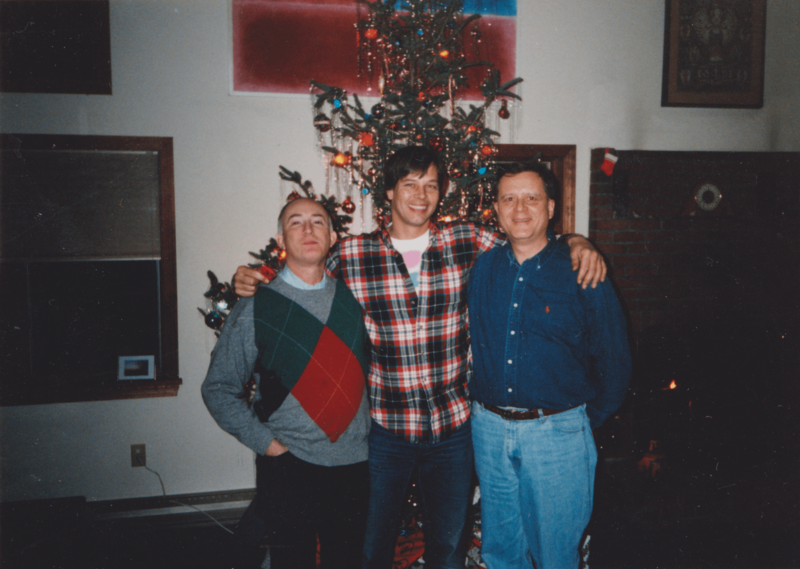 Michael in his living room in Provincetown with good friends Ron (left) and Robert (right) at Christmastime. But things are different when a loved one gets really sick, or after you’ve lost someone. You need space, you lose bandwidth, you can’t hold the smile quite as long. You forget things, you flake, sometimes you don’t even send regrets. People tend to be nice about it. You and they know this is temporary, that eventually you’ll have the capacity to entertain and to laugh again. But that’s hard to think about. False Clues is the eighth poem in Cape Cod Light. It first appeared in SQUiD, a “semi-defunct and apocryphal Provincetown publication“. The date there for the poem is May 1980, which means he wrote it while a professor at Muhlenberg. With your knapsack, cigarettes, and kisses. One thing replacing another, as Orion exiles Hercules. But this is an apology. I’ve stood you up before with a worse excuse. You understand, but it’s not all the same to me. Just as the sky does, every year, with its stars.